Are you keen skialpinists? Or ski freeriders? Or backcountry skiers, snowshoe hikers? 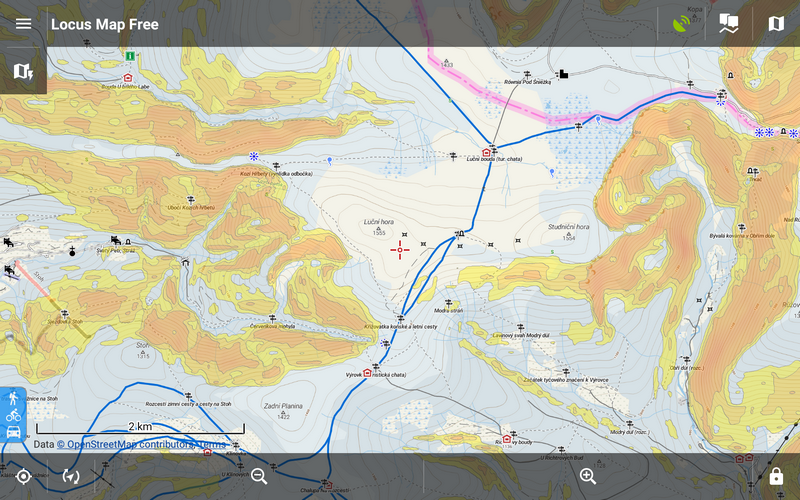 Then you’ll surely welcome information about slope angles in the map of your favorite mountains. 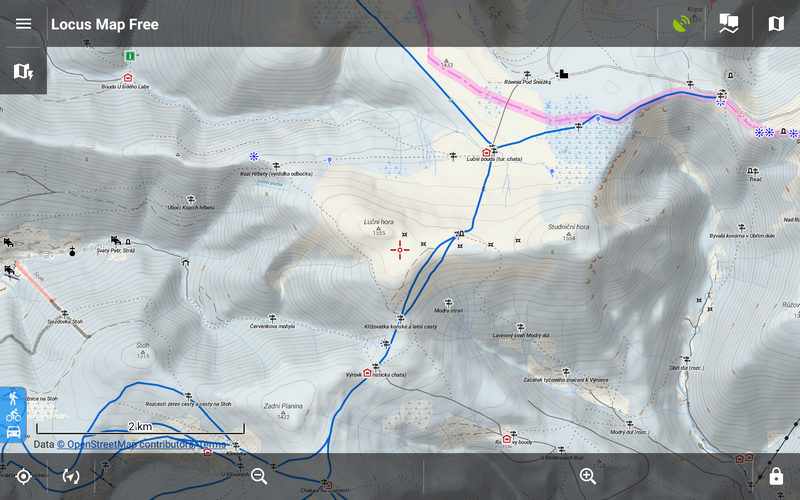 Until recently this information was available only in winter Outdooractive maps that Locus offers in Germany and Austria. New version of Locus can display slope angles above any map – online, offline, topographic or satellite, raster or vector, from any producer or provider. It’s up to you to select one. Are you traveling in a scattered group and would you like to know the position of its individual members? That may be quite useful just for example when skialpining. 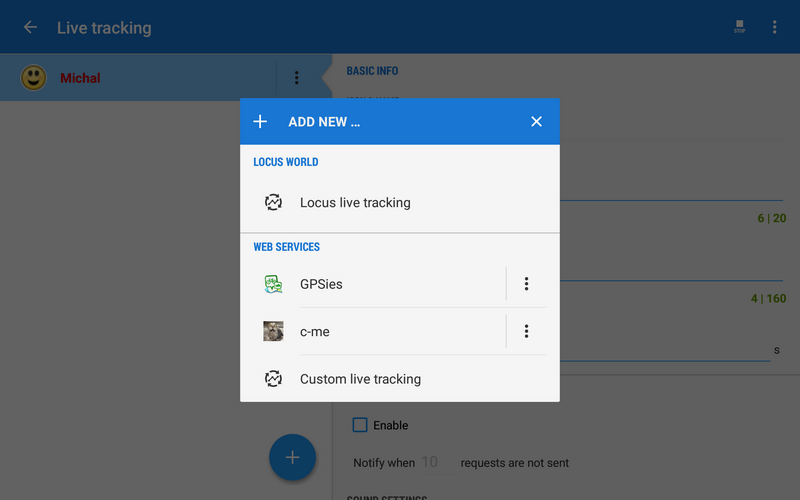 We are introducing a brand new Locus live tracking, that doesn’t use services of third parties. Just insert your name or nick, start and your friends see you hover above the map. What slopes tend to avalanche? There is a whole range of factors that influence probability of avalanche danger. Of course there are weather conditions, snowpack layers content or the terrain properties. A very important factor is, however, the angle of the slope under the snow cover. Slope angles higher than 30° are on the verge of risk, steeper angles 35°and 40° multiply the danger. For safe planning of your snowy adventures it is, therefore, useful to now this information and you can plan your trip routes according to it. The winter Outdooractive maps that Locus presents in its portfolio contain slope angles but only in the area of Germany and Austria. In the Canadian Rockies or Caucasus you would look for them in vain. Until now. Locus can calculate and interpolate slope angles from elevation data that are available worldwide. We wrote recently that you can set the live tracking feature via cooperating web service GPSies.com. It is cool to see your pals online on a web map but the setting isn’t much user-friendly. 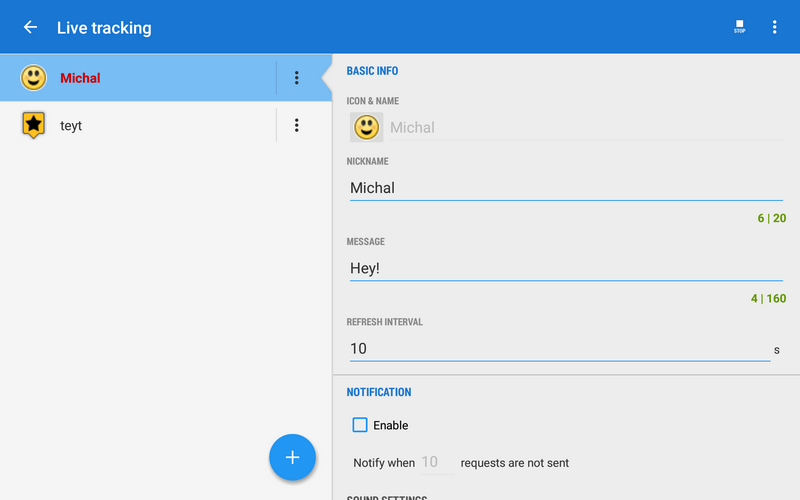 Now we are introducing a dedicated service that connects Locus users directly among each other – you can track your friends right on your Locus map screen. And Locus Free users too! We have pre-set also two cooperating web services for you – already known GPSies.com and also a testing interface of one our VIP user. For geeks we left the option of custom live tracking settings as it used to be originally. It wouldn’t be a new release without loads of minor fixes and improvements. Randomly, optimized values in the trip time feature, improved online search and many others. Dobrý deň.Neviem prečo ale po uložení bodu záujmu waipontu mám tento bod uložený a je aj na mape.Ale po vypnutí aplikácie a znova zapnutí aplikácie tento bod zmyzne. záleží na tom, jakým způpsobem si bod uložíte – pokud po importu zaškrtnete možnost “Pouze zobrazit (bez importu)”, tak se bod neuloží vo databáze Locusu, ale pouze do jeho dočasné paměti, která se při restartu maže. The display of slope angles really works great! I would really apprechiate an easy access to switch between “normal” hillshading and the precise display of slope angles. Maybe in a future app-version the button “Hillshading” in the quicksettings menu could toggle hillshading > slope angles > nothing. This would spare all the way througt the settings menu to switch between hillshading and slope angles. Thanks to all the team for your brilliant work with this wonderful app!!! Habe mir extra die pro version gekauft, aber leider funktioniert die graphische Darstellung mit den Hangneigungen nicht. Haben Sie die Option Winkel der Heizkurve in Menü> Einstellungen> Karte – Voraus> Karte Beschattung? Und haben Sie Höhendaten des Gebiets heruntergeladen? Zdravím. S kamarádem jsme zkoušeli novou funkci Live tracking, vše jsme nastavili dle návodu, máme LT spuštěné, ale na mapě v Locusu se nevidíme. Děláme něco špatně? Předem díky za pomoc. Máme oba Locus Pro a data aktivní. Dobrý den, příčina může být bud v nedostatečném signálu GPS nebo se z nějakého důvodu neposílají/nepřijímají data. Nestačím se divit, co za další a další vychytávky Locus přináší. Skvělá práce. Dotaz Jany by mě také zajímal. A další by mě zajímalo, kolik live tracking spotřebuje dat? Livetracking spotřebovává minimum dat v řádech jednotek kB. Nice with the new options! This is great, live tracking was the only remaining weak link for Locus. I don’t understand how I can use it though, there seems to be some detail missing after the press start button comment. How do I get to be part of a team, how can I use Locus on a tablet at home so my wife can track my position live? Are there more detailed instructions somewhere. I’m grateful for the development but I’m not sure how to set it up. What name do I have to fill in for field user name? I typed ‘Steffen’ e.g. and when pressing Start I get a validation message ‘Invalid value: user name’. Did I get this correctly? Everyone can see everyone in his map who has enabled live tracking? Dobrý den. Jásám! Live tracking ala lokusí verze velmi potřebuju, protože se často hledáme se zbytkem rodiny na výletech. Toto by mohlo vyřešit beznadějné telefonáty typu “Kde jsííí?” “No tady v kleči..” 🙂 Jen jsem se chtěla zeptat, jestli jde nějak nastavit, abychom se viděli jen naše rodina navzájem a ne aby mě mohl špehovat kdejaký uživatel Locusu. Locus sice používám roky, ale nejsem až tak technicky zdatná a toto mi není jasné. Děkuji za odpověď, Jana. privátní skupiny jsou dalším krokem, který do Locus live trackingu přibyde. Jak píšeme v článku, současná verze je Beta, sloužící pro otestování základních funkcí a až bude vše tak, jak má být, pustíme se do dalšího vylepšování.